There are number of free anti virus software for Windows users. Fortunately, lot of free anti virus protection software options are also available for MAC OSX (Apple) users. ‘Virus cannot attack MAC OSX’ is no longer true. Hence, MAC OSX users should use anti virus protection software to stay protected from online threats and keep personal data safe while connected to the internet. Following is list of best free anti virus software for MAC OSX users. You may download and install either to get certain level of protection for your MAC system. Sophos for MAC provide one of the best and more complete anti virus software solution for MAC OSX users. Best part, it is free protection software for home users and provide protection from viruses, trojans, worms (and even from threats designed for Windows). It allows you to quarantine questionable files and check them again later. You can perform quick scanning by right click or perform custom scan on specific files. 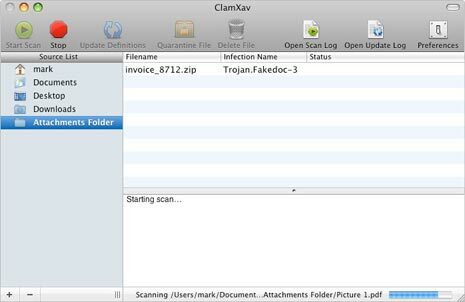 CalmXav scanner is a free virus detection software for MAC OSX users. It has simple interface that can keep check on both Windows and MAC threats. It updates automatically with free virus definition files required for detecting latest threats. You can start – stop virus scanning, quarantine files, check scan log for more details. This free anti virus program for MAC is compatible with 10.4, 10.5 and 10.6 Snow Leopard. 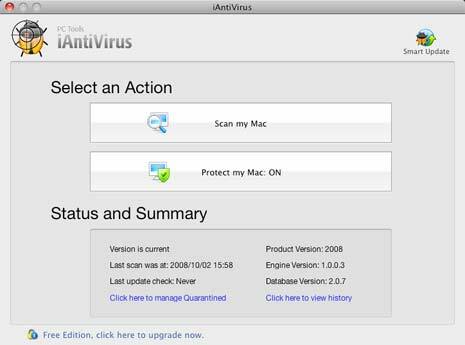 iAntivirus software from PC Tools is a free program for protection against cyber threats for MAC OSX users. User interface is very simple with focus on key activities of virus scanning, management and removal. This software works silently in the background without hogging too many system resources. It supports real time protection, auto update and quarantine features. While above are best free options, there are number of paid (premium) anti virus software programs form MAC OSX from popular security software companies. This includes: Norton Anti Virus for MAC, BitDefender AntiVirus 2011 for MAC and McAfee Virus scan for MAC. I have visit your blog. And i found useful and knowledgeable information about freeware antivirus programs. Thanks for sharing such type of nice information.I appriciate to read this type of needed information with your blog.